The Old Hobartian Track seems to one of those trails that is rarely walked and rarely written about. It’s a shame too, as it provides one of the most challenging hiking experiences within Wellington Park. The trail leaves from Lenah Valley Road, zigzagging its way up to Pinnacle Road via the Lost World. The trial isn’t for the faint hearted. Though only 3.5km to the summit, a climb of 950m is grudgingly scaled over that distance. Brilliant views of the Derwent River and Northern Suburbs are on offer at the top, along with the breath-taking dolerite cliffs of the Lost World. Beginning at the end of Lenah Valley Road, cross the creek via the concrete bridge and head past the gates. 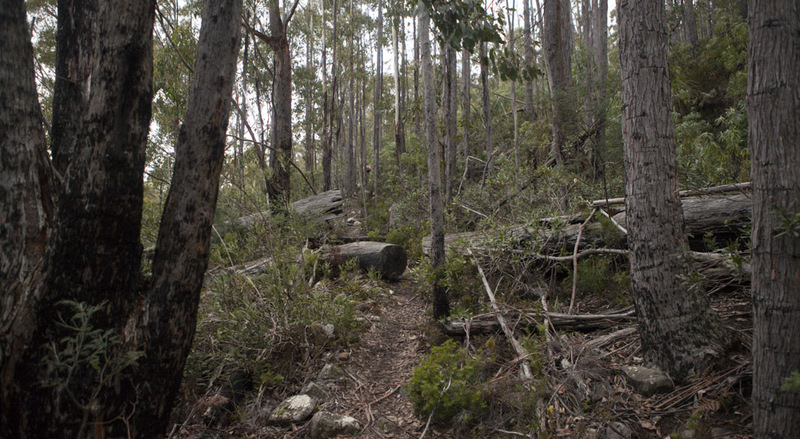 After 100m the trail forks, follow to the right via the Lenah Valley Fire Trail. The trail climbs gently for the next 500m reaching an easily accessible section of the New Town Rivulet. Continue up the rock steps of the Lenah Valley Track signposted nearby. The trail climbs for the next 20 minutes, reaching a small ruin and the junction to Old Hobartian Track. For the next 45 minutes the trail climbs through thick eucalyptus forest, zigzagging alongside the New Town Rivulet. At one point the trail ducks under an impressive sandstone cliff face signed by decades of visitors. Shortly after, a junction is reached, to the left the trail continues to The Chalet, a point on Pinnacle Road above The Springs and right to the Lost World and the Big Bend section of Pinnacle Road. Taking the right hand track towards the Lost World the trail quickly becomes steeper and rougher, climbing 600m over just 1.5km. Marked only by cairns and red dots sprayed on boulders the track can be challenging to follow at times. 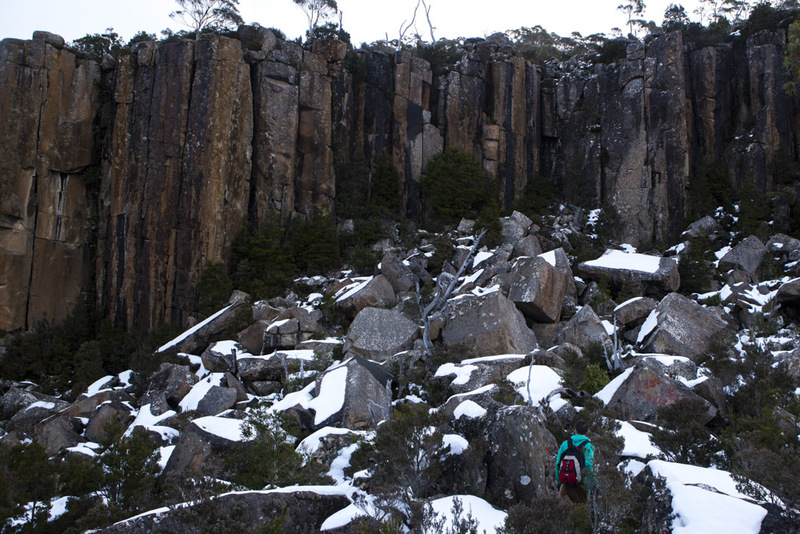 Once the climb to the Lost World is complete you are surrounded by tremendous dolerite cliffs and tessellated boulders. In clear weather views towards the Northern Suburbs and Derwent River are also on offer. Following the markers the trail leads towards the right hand side of the plateau. Pinnacle Road is a further 30 minutes steep hike from here. The Old Hobartian Track is a seriously steep hike with some difficult sections needing to be traversed. 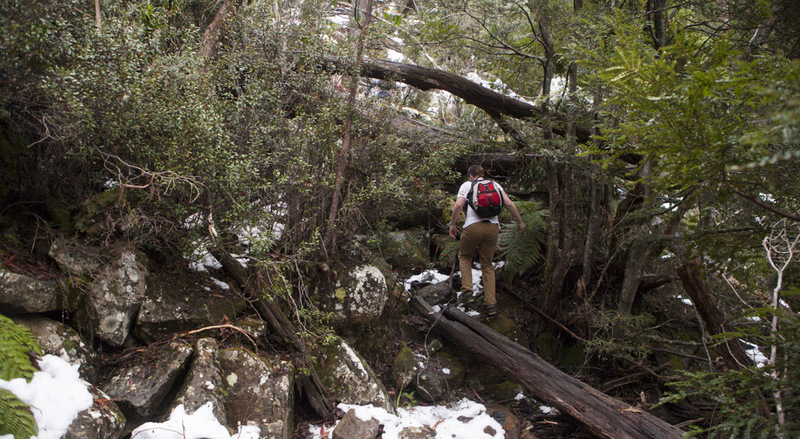 It is this challenging aspect however that sets it apart from the majority of other Mount Wellington walks, making it a worthwhile experience for seasoned hikers. Once at the top the walk enters a sub-alpine area, be sure to take appropriate clothing. Careful footing is needed in bouldering sections. Not recommended in heavy snow coverage as large rock gaps may be covered by snow.